'Before you, my home was decorated in style. After you, my home is decorated in love.' So begins the tender recital of love from parent to child that tells the story of the changes that take place after a little one joins the family. Along Came You combines simple yet insightful text by Karona Drummond with vibrant illustrations by Estelle Corke in this board book that answers the questions: What happens when the pleasures of a tidy, carefully decorated home are traded for the excitement of dressing up and messy art projects? When quiet evenings and precisely planned schedules are exchanged for busy days and crazy nights? What happens when the desire to experience joy yourself is replaced with the desire that another might experience joy? Karona Drummond is a certified elementary school teacher. She has taught preschoolers for over 15 years. She spent several years at Texas Woman's University Child Development Center and several years at the University of North Texas Child Development Laboratory. Her publications include 'The Running Years,' which was chosen for the 'Hats Off To Dads' section of the Tejas Storytelling Festival. Her writing includes stories for preschoolers and elementary-aged children and inspirational poetry for adults. 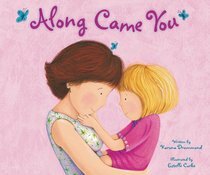 Customer Reviews For "Along Came You"